The United States first established air bases in Kurdish-held areas in northern Syria in October 2015. In March and April 2016, the US added supplemental sites in the region. 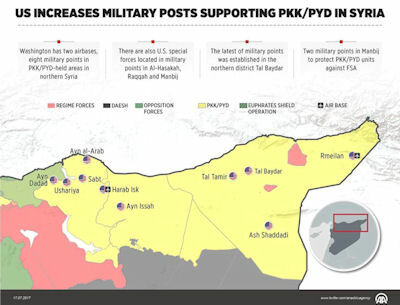 By mid-2017 the US had increased the number of military posts in the terrorist PKK/PYD-held Syrian territories to ten. 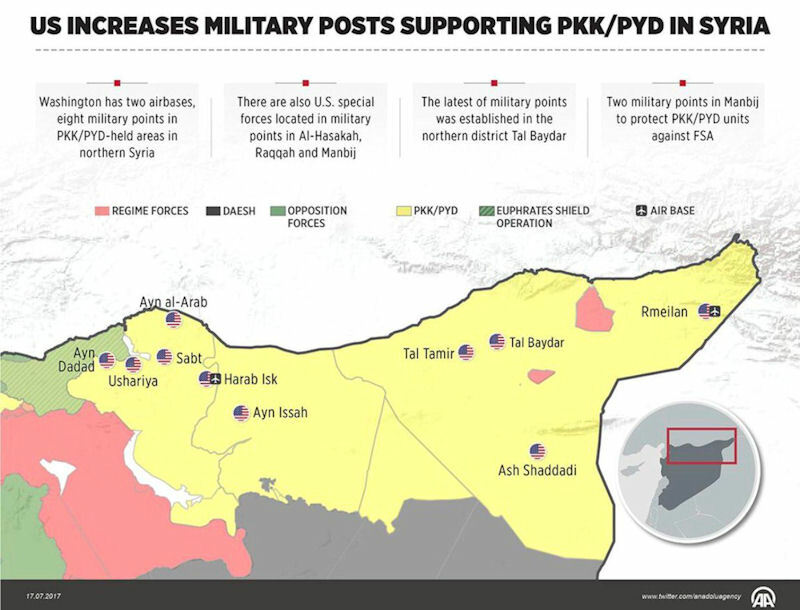 According to Anadolu Agency reporters, a U.S. military point has recently been established in PKK/PYD-held areas in northern Syria. Washington had set up two airbases in PKK/PYD-held Rmeilan district in the northeast of Al-Hasakah province in October 2015 and Harab Isk village in southern Kobani in March 2016. While the Rmeilan airbase is large enough for cargo planes to land, Harab Isk base is only used by military helicopters. While a part of the U.S. military aid to PKK/PYD goes through Iraqi border by land, the other part is shipped to the region through the Rmeilan airbase. There are contact officers for airstrikes and artillery shelling, military consultants, training officers, operational planning officers and military units to engage in active conflicts in eight military points. The equipment in the military points includes artillery batteries with high maneuverability, multi-barrel rocket launchers, various mobile equipment for intelligence and armored vehicles such as "Stryker" for general patrols and security. There are also three military posts in the northern province of Raqqah. Along with U.S. special forces units, French special forces are stationed in a military post located in Mistanur hill, south of Kobani. Around 200 U.S. soldiers and 75 French special forces units are also stationed in the PKK/PYD base in Ayn Issah town in northern Raqqah. A military post in the town of Sirrin in Kobani is also used for airbornes. PKK/PYD is supplied with military equipment and ammunition through this post. Pentagon spokesman Major Adrian Rankin-Galloway said the US Department of Defense is concerned about the disclosure of secret military bases in Syria, which was due to the publication of a map of American positions by the Turkish state news agency. “The publication of the secret military information exposes coalition forces to unnecessary risk and may disrupt current operations to defeat ISIS. And although we cannot independently verify the sources that contributed to this publication, we would be very concerned if NATO ally officials deliberately put our forces at risk,” the spokesman said. There is no legal basis for US military bases in Syria, Russian Foreign Minister Sergei Lavrov said at a press briefing 21 July 2017: ""The United States does not advertise its bases very much, and the fact that these bases do not have a legal basis is also obvious to all... One more big difference: we do not hide our two bases, they are created and operate on the basis of intergovernmental agreements, and their task is to assist in the fight against terrorists... I don’t object to American bases in Syria as long as the Americans reiterate that their illegitimate presence in the Syrian Arab Republic, because, unlike us, they were not invited by the government... "
The map with the ten US bases in the Syrian provinces of Al-Hasakah, Manbij and Raqqa, as well as in the areas of Harab-Isk and Rmeilan, was published on 18 July 2017 by Turkey-controlled leading media, Anadolu Agency. The source also reported on the number of the U.S. servicemen deployed at these bases. The Anadolu Agency stated the data on the location of the bases was obtained not as a result of a leak but in the wake of its own investigation, as well as from publications of Kurdish fighters in social networks. The person written the article for Anadolu, correspondent Levent Tok even stated that “the U.S. leadership should have thought about the possible development of events ages ago, when Washington was only about to plan to cooperate with a terrorist organization” (ie,: Kurds). Turkish Presidential Spokesperson Ibrahim Kalin said July 20 that the government did not leak any information to the state-run Anadolu Agency on the locations of U.S. bases in northern Syria, noting that the news report providing a detailed map on where the American troops are deployed was done entirely by the agency. “As Turkey, we can never have the idea to put the lives of any of our allies’ troops in danger anywhere,” Kalin told reporters at a press conference. Kalin said information on the locations of the U.S. bases was not given to Anadolu Agency by the government but correspondents on the ground used its own reporting network when preparing the news piece. The Defense Logistics Agency is supporting the fight against the terrorist group that calls itself the Islamic State of Iraq and the Levant. DLA personnel are deployed to several nations to support U.S. military forces as they supply and train forces ranging from the Iraqi Army to the Kurdish peshmerga to local forces in Syria. Unlike Iraq, however, the local forces in Syria are not a single, organized national army. Instead, multiple, fluid, unofficial militias. And thanks to DLA, through its support to deployed U.S. military forces, they get their hands on nearly everything they need. Supporting the fight in Syria, like the fight in Iraq, comes with its own set of bureaucratic challenges. For one, the sites are not U.S.-owned facilities, in contrast to most of the bases the coalition forces operated from in earlier Middle East operations. And even close U.S. allies have their own systems of regulations, much like the United States. This means tasks can take longer than they did during the recent U.S. operations in Iraq.